There is a $50 non-refundable application fee for all new students that covers the cost of the teacher "meet and greet" (PK3 and PK4) or placement test (Kindergarten through Grade 8). There is a $300 non-refundable enrollment fee per student. The enrollment fee ensures your intention of attending Holy Family and secures a place for your student in the fall. The enrollment fee is not applied to the tuition assessment. The enrollment fee must be paid in full for consideration in the grant and aid process. Be a registered, active member of Holy Family Catholic Church. To be an active member of this faith community means to be a good steward of God's gifts and to live out your Baptismal call through Time, Talent, and Treasure. Be a registered, active member of another Catholic church in the Diocese of Fort Worth. The local pastor will use their sole discretion in defining active membership. Applying for the Parish Tuition Rate is part of the Online Enrollment process. Deadline for submission is April 1, 2019. There is a $25 non-refundable registration fee for the Enrichment Program. Students must attend the curriculum portion of the day to be able to attend the Enrichment Program. Holy Family Catholic School partners with FACTS to offer an online tuition mangement and incidental billing platform. 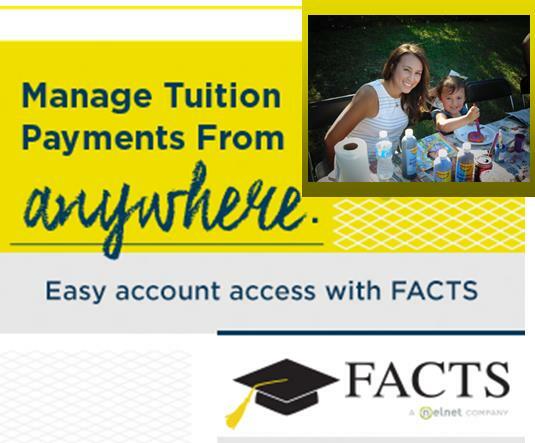 All families are required to establish a FACTS account with a bank account or credit card for the payment of scheduled tuition charges and all other incidental billing. You'll have the option to manage your account from your phone, tablet, or computer whenever life gives you a free moment. 10-monthly payments, July through April, on the 5th or 20th of the month. Incidental billing charges are due when billed.